At 9.30 this morning, a group of about 300 Turkish and international activists began a peaceful march towards the entrance of the 5th World Water Forum in Beyoglu to express their concerns about the political agenda of the event and prevent people getting inside. 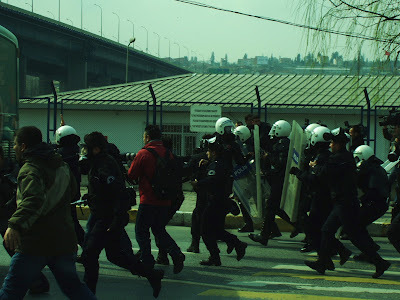 Turkish police forces, outnumbering by far protesters, quickly intervened and charged, using rubber bullets, separating Turkish activists from international protesters and violently dispersing the action. 17 Turkish activists from the "No to commercialisation of water platform" were arrested, mostly women who couldn't escape fast enough and one high-profile leader of anti-dam movements. Arrested activists are now in hospital, waiting for their transfer to Vatan police station where they might be prosecuted for illegal protest. The renowned Turkish hospitality seems to not apply to those critical of the World Water Forum. Other activists then entered the WWF venue to protest against this inacceptable way of treating democratic protests and further challenge the World Water Council and Turkish government's water privatisation plans.